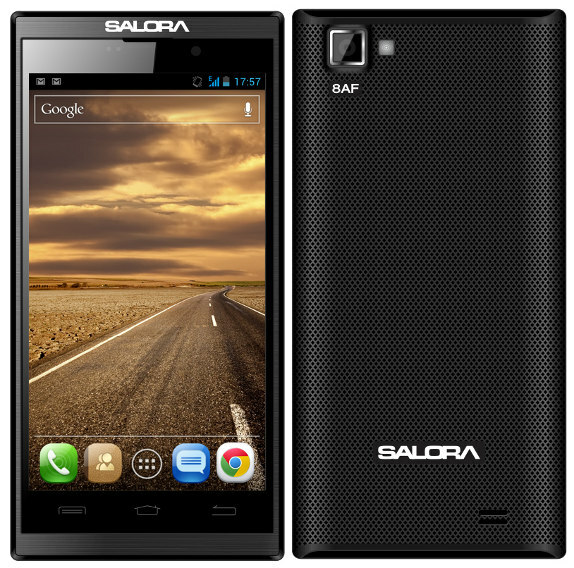 Remember the Salora PowerMaxx Android smartphone with a huge 3200 mAH battery? It was launched a couple of months back at a price of Rs. 15,999 and it ran Android 4.0 ICS. Just two months after release, it is receiving the Jellybean update from the company, promising to start the roll out from March 15th, which is today. So, the JellyBean update brings new features including Project Butter and Google now to the device, along with several improvements in performance and stability. The phone has a 4.5-inch (540 x 960 Pixels) qHD IPS LCD capacitive touch screen display. It is powered by a 1GHz dual-core Cortex A9 processor and sports a 8MP auto focus camera with LED Flash, with 720p HD video recording and a 1.3MP front-facing camera. The company entered the mobile phone market with dual-SIM feature phones back in 2011. The display of the phone is touted as a zero gap display made using advanced assembling processes. The roll out should have started already. So, any of you got this phone and have you gotten the update? Do let us know in the comments section below.